There is a total solar eclipse in March 2015 close to the UK. Image: Francisco Diego/UCL/Explore Worldwide. 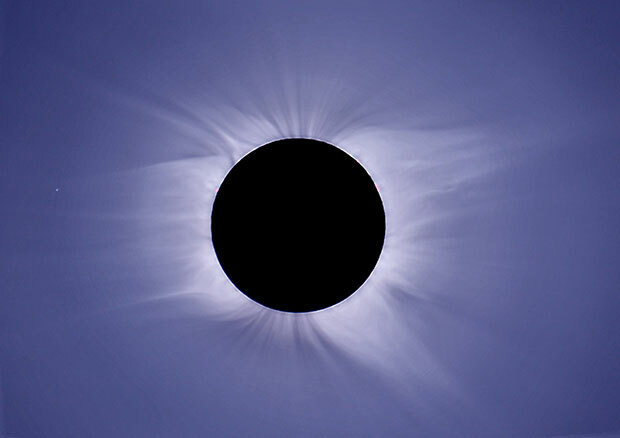 All eclipses of the Sun are interesting, but for sheer grandeur total eclipses are unrivalled; only then can the solar chromosphere, the prominences and the corona be seen with the naked eye. Total solar eclipses occur when the Sun, the Moon and the Earth are exactly lined up, so that the Moon’s shadow reaches the surface of the Earth. 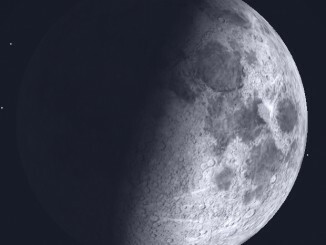 However, the main cone of shadow (the umbra) is only just long enough to do this and totality can be witnessed from only a very restricted area of the Earth’s surface as the Moon’s shadow sweeps along a narrow corridor known as the path of totality. To either side of this track only a partial eclipse will be seen. On 20 March 2015, the Moon’s umbra will race across the North Atlantic Ocean at supersonic speed, narrowly skirting the south-eastern corner of Iceland and making landfall at only two places – the Faroe Islands and the Svalbard archipelago. Eclipse chasers will either need to make their way to these two locations or observe from onboard a ship or perhaps from an aircraft flying along the path of totality. 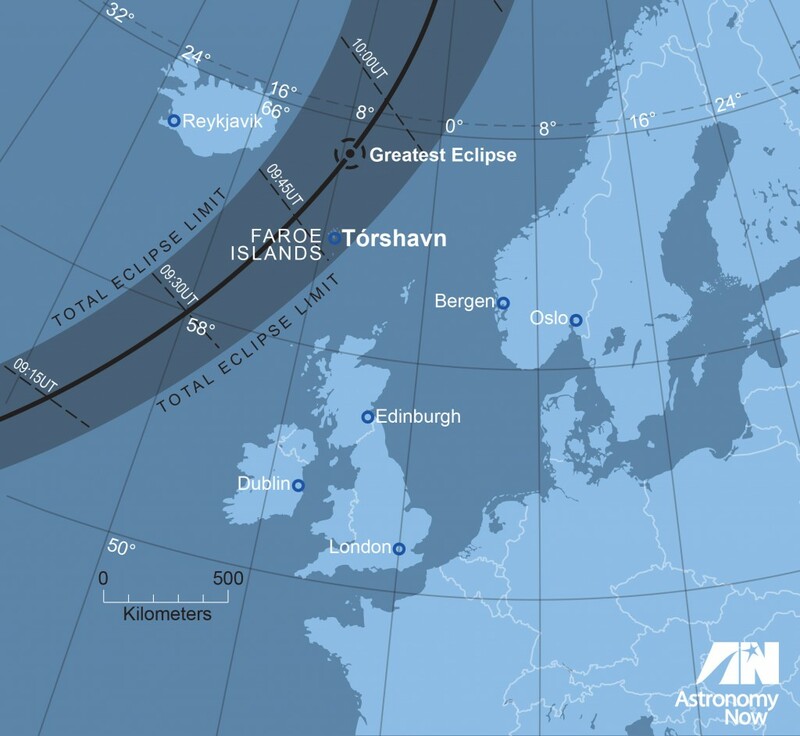 Greatest eclipse occurs at 09:45:38 UT on 20 March, from a location slightly north of the Faroe Islands, where the duration of totality will be two minutes and 46.8 seconds and the path of totality will be 462.6 kilometres wide. Although nowhere in the British Isles will witness totality, a very significant partial eclipse will be seen right across the region, lasting well over two hours. Indeed an obvious partial eclipse will be visible from every country in Europe. 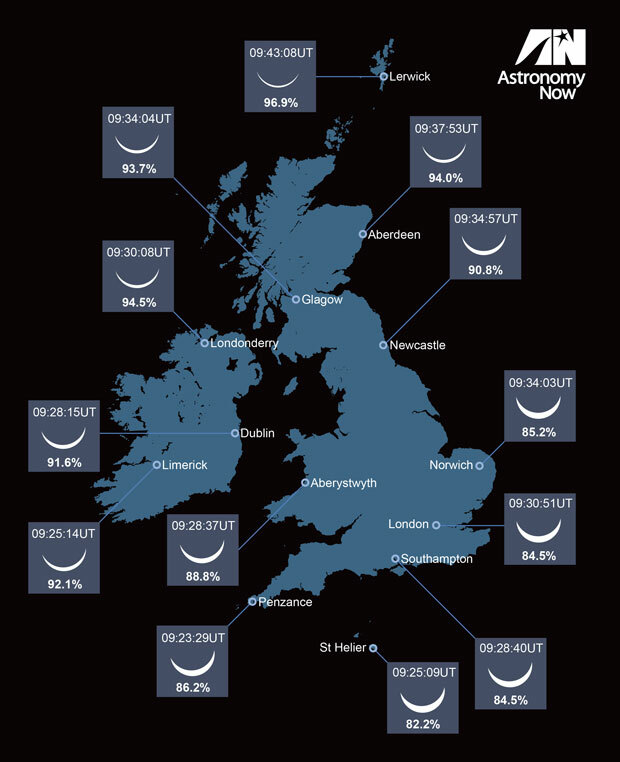 The partial phases of the eclipse that can be expected across the UK. AN graphic by Greg Smye-Rumsby. The path of totality for the 20 March 2015 solar eclipse. AN graphic by Greg Smye-Rumsby. The key to success in the Faroes would appear to be mobility and a willingness to choose a suitable observing site at short notice based on the prevailing weather conditions and wind direction. If fog and very low cloud are the main problem, then the best approach will be to select a site on the top of the hills and hope that the Sun breaks through. The Faroes are very hilly, with many bays and fjords, but travel is comparatively easy thanks to a network of tunnels and bridges that link the islands and cut beneath the peaks. This ease of movement will be of great benefit if it turns out that some last-minute manoeuvring and a change of observing site are needed to avoid troublesome clouds during the eclipse. There is a good chance of at least some openings in the cloud cover unless a large-scale weather system is affecting the islands. Quick thinking and an element of luck will be needed! The other landfall of the 20 March 2015 total eclipse is in the islands of the Svalbard archipelago, most notably Spitzbergen, the largest island of the group. At this latitude (78 degrees north), polar easterly winds prevail, but passing low pressure regions can bring a southerly flow with thick cloud and steady precipitation. As with the Faroes, the Svalbard island terrain is steep and the valleys and fjords control wind direction, cloudiness and precipitation. The degree of surrounding ice cover is also of great importance here because sea ice blocks the moisture from the ocean surface and the weather is colder and clearer – good news for eclipse watchers. Most travellers will probably head for Longyearbyen, the main town on Spitzbergen (with a small population of around 2,000 inhabitants) and the area’s primary port, administrative centre and the only airport on the islands. The location is stunningly beautiful; large glaciers cover much of the island and icebergs float around the town. On 20 March the Sun will rise to an altitude of 11 degrees at totality from Longyearbyen, but because of the kilometre-high mountains to the south and south-west, the eclipsed Sun will be hidden from most of the town and viewing sites must be chosen carefully to ensure that the Sun is visible during totality. Longyearbyen lies at the mouth of the 30 kilometre-long Advendalen valley and the main road from the town runs south-east along the valley, providing access to a flat plain that is good for eclipse-viewing. Steep hills to the south side of the road will hide the Sun from many places on the road itself, but valleys between the hills may enable the eclipse to be seen. However, there is an obstruction-free view of the Sun from the broad three kilometre-wide area to the north of the road. AN graphic by Greg Smye-Rumsby. Throughout Svalbard there is a significant threat from polar bears all year around. It is not advised to leave the settlement limits of Longyearbyen, which are clearly marked with signs bearing the picture of a polar bear, without the advice and assistance of local guides. 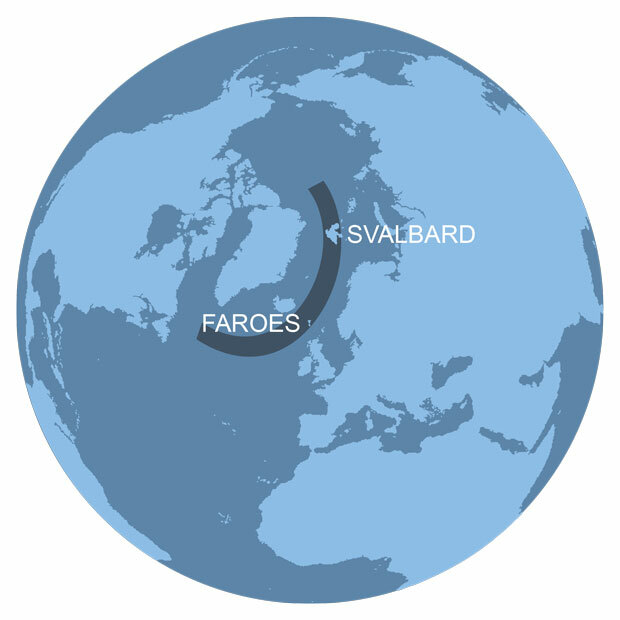 Given the general storminess of the North Atlantic in March, it is likely that some cruise ships carrying eclipse watchers will head for the usually rather calmer waters near Svalbard, particularly around the southern shores of the islands that are often ice free in March. And if the skies are clear as darkness falls on eclipse day, there is also the chance of viewing the northern lights from Svalbard. What a fabulous opportunity to view two of nature’s greatest spectacles on the same day! Dr John Mason has been chasing annular and total solar eclipses for over a quarter of a century. He accompanies eclipse tours organised by Explorers Astronomy Tours. This article first appeared in the March 2014 issue of Astronomy Now. In the March 2015 issue of Astronomy Now, on sale now, veteran eclipse chaser Nick James describes what you can expect to see during March’s solar eclipse. Get your copy in the shops or order online. 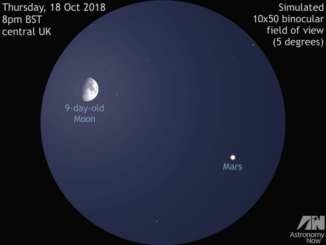 Skywatchers in Western Europe looking in the southern sky at dusk on Thursday, 18 October can see the 9-day-old waxing gibbous Moon close to the upper left of Mars, the pair fitting comfortably in the same field of view of typical binoculars. This is also a good night for spotting some prominent martian features telescopically – seeing permitting! 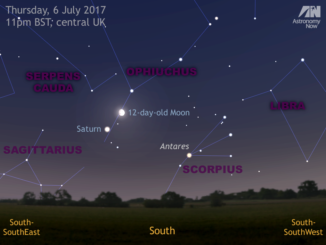 Skywatchers in the UK and Western Europe should cast their gaze low in the southern sky late into the evening of Thursday 6 July to see the 12-day-old waxing gibbous Moon in conjunction with ringed planet Saturn. The pair are separated by just 3½ degrees, nicely framed in a typical 10×50 binocular. For telescope users, the night of 6—7 July is also good for spotting Saturn’s bright moons. We show you what to look for and where.